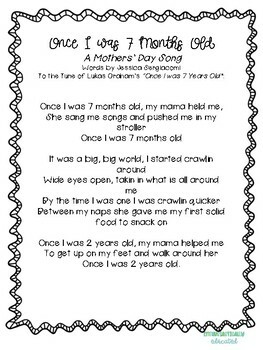 Mothers' Day Song- To the popular song "Once I was 7 years old"
Warning- This is a tear jerker. But it always makes the Mom's so happy on Mothers' Day. We usually decorate a mayson jar and put an electronic candle in the jar while we sing. Not a dry eye in the room and kids are so proud. Yes - It takes a lot of practice with the first graders, but students can all relate to the song. Usually I let them edit it a tiny bit if they have something to relate to. Original song was brainstormed with first grade class. I hope you enjoy this. Thank you @ateacherscreativespace for the font! Obviously I love it.